DECENT, known for building a DPoS blockchain ideal for content distribution, has just released a new tool to help facilitate the decentralized governance of their DCore network (by way of voting for miners). Combining simplicity and efficiency, this tool delivers an improved voting experience for all DCT holders. Here’s the first look at the new application (screenshots included). DCore runs on a Delegated Proof of Stake (DPoS) consensus mechanism, meaning the network is maintained by elected miners from within the community of stakeholders (anyone holding DCT). 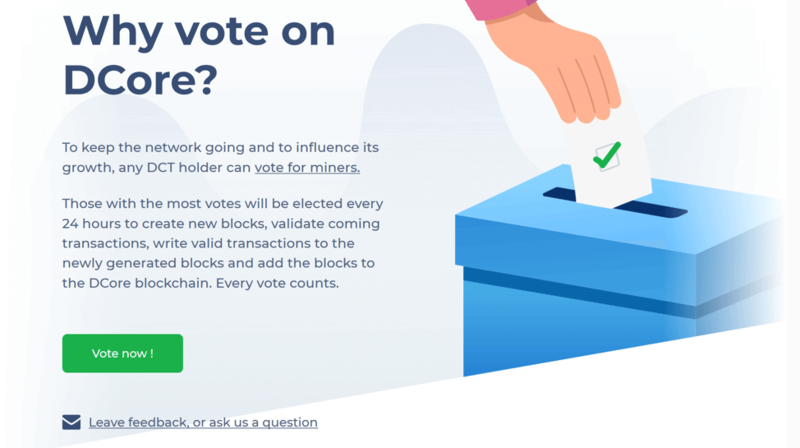 Previously, the process of voting for and electing a miner was a bit complicated, but it’s about to get a whole lot easier! The developer team at DECENT has created a user-friendly voting tool where stakeholders can cast their votes for any of the currently running miner nodes. Miners can create individual profiles where they highlight their own attributes and express the reasons why voters should vote for them. With this new tool, a stakeholder can now vote for any miner simply with the click of a button (and unvote just as easily). “Our DECENT team is excited for the whole blockchain world to see what DCore can do, and in order for performance to be at its best we need reliable miners maintaining our network. Making sure everyone has access and the resources to make informed choices is essential to maintaining a truly decentralized network. This is the reason we have simplified and improved the voting process. We look forward to seeing the impact this will have and want to remind all of our stakeholders to vote responsibly!” – Matej Michalko, Founder and CEO of DECENT. DECENT is a non-profit foundation that has developed an open source blockchain ecosystem focused on helping businesses adapt to a decentralized future. With their proprietary technology and platform called DCore, DECENT can improve a wide range of real-world applications, especially content distribution networks. DCore is the blockchain you can actually build on. Developed by DECENT, this platform is set to revolutionize the way digital data is exchanged by providing simplified, decentralized and borderless content and data distribution for applications (dApps). DCore is an open-source solution for companies looking to fast-track their own blockchain-based ideas.